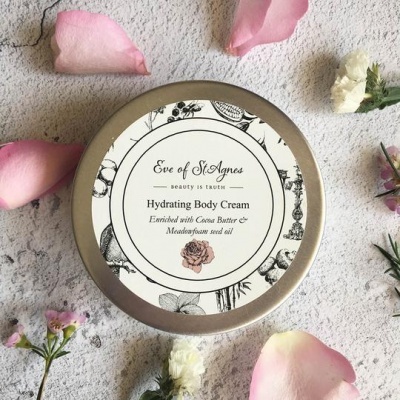 A natural Body Cream, plastic free packaging. Organic ingredients, cruelty-free and vegan. Suitable for normal and dry skin types. A natural Body Cream, plastic free packaging. 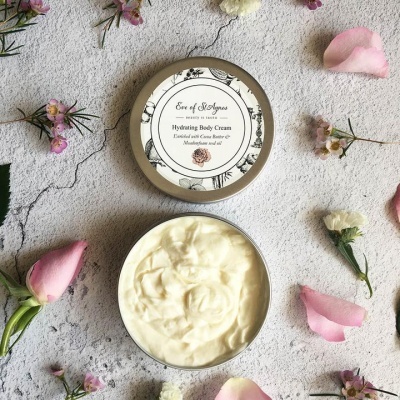 This vegan body cream is made with organic ingredients to create an extremely hydrating, yet non-sticky cream that has a beautiful, silky feeling. Excellent for normal and dry skin types. The formula contains cocoa butter and a wonderful natural ingredient called meadowfoam seed oil. It has unique properties that make it the perfect oil for dry skin as it sinks into the skin amazingly well and soothes dry skin. A hand-blended natural fragrance of rose absolute, frangipani, sweet orange, bergamot and rose geranium creates a delicate, alluring fragrance. Silver Award winner at the Free-from Skincare Awards.